Nurses and other health care professionals who work with victims and perpetrators of violence are often confronted with issues that they may not have prior training in, such as identifying and managing victims of violent crime. This book is designed to serve as a quick resource for practicing health care providers treating adults and older adults, as well as students or practitioners new to the field. 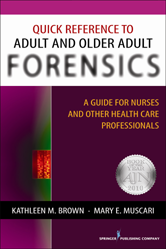 The book not only has full descriptions of principles of evidence, but also offers detailed guidelines on how to conduct a forensic assessment of adults and older adults. Additionally, the authors examine the concepts of competency and guardianship, and provide guidelines for navigating the justice system. The authors provide current, concise, and easy-to-use information in short chapters that assist practitioners with the prevention of crimes and the identification and management of both victims and offenders.